I have LOTS of ideas for books. BUT then I worry, how will I ever write and illustrate this book???!!! I need to think about the idea! the shortest was 2 days. on a science book like Pumpkin Day! or Rocks! Rock! Rocks! or Shells! Shells! Shells! or Leaves! Leaves! Leaves! I do a LOT of research at the library. see them, and to touch them. a better understanding through really LOOKING. Getting started: THE THUMBNAIL SKETCH!!!! 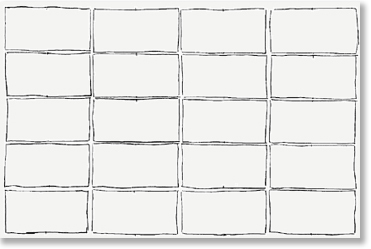 I draw tiny rectangles on a sheet of paper. Each rectangle is for 2 pages in the book. line drawings, ideas, words, phrases. 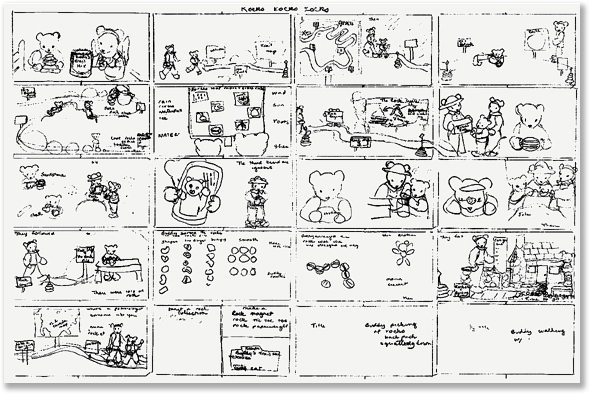 The thumbnail sketch allows me to see the book idea on one or two pages. (I work really messy!) I can make notes, add to my sketches, change things, take things out, rearrange things before I start drawing full-scale drawings and writing the text. I have gotten to know Buddy and Minna pretty well. It makes it interesting to have my characters have different personalities, for the reader AND for me when I am writing and illustrating. Buddy likes to learn by looking. Buddy also says, “I’m hungry. Minna and her family are thoughtful. Minna says,“I’m still thinking” a lot! I use Origami paper. The colors are so beautiful! AND I use found paper which is paper I FIND! to really LOOK to SEE and to WONDER! groups with other children’s book authors and illustrators. We “peer edit” for each other. The art designer brings her skills to my books too. Thank you for visiting my web-site! I hope you will Read! Read! Read! Create! Have fun! and Remember to Recycle!